You don't have to be a math lover to love this fabulous polyhedron garland. Of course, if you are a math girl than you will appreciate the bright and colorful platonic solids even more. You can mix and match the cubes, icosahedrons, tetrahedrons, octahedrons, and dodecahedrons of you can pick one shape and just add a rainbow of colors. The printable 3 dimensional shapes also make fun boxes to hide treats in if you aren't looking for a garland idea. 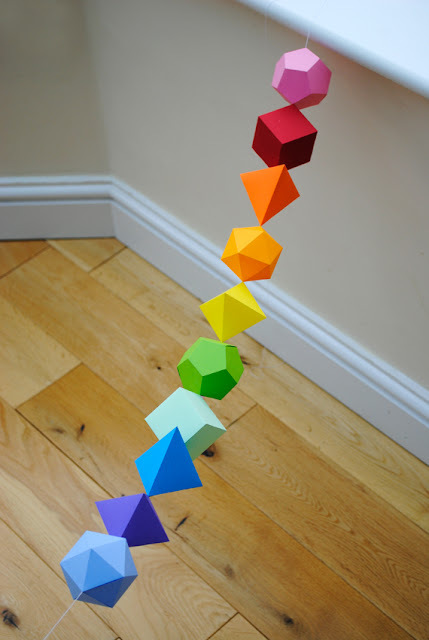 You can get the printable templates to make the platonic solids and directions for making this polyhedron garland over at MiniEco. Sheldon would LOVE this idea! We're math lovers, so this is great. Thanks!